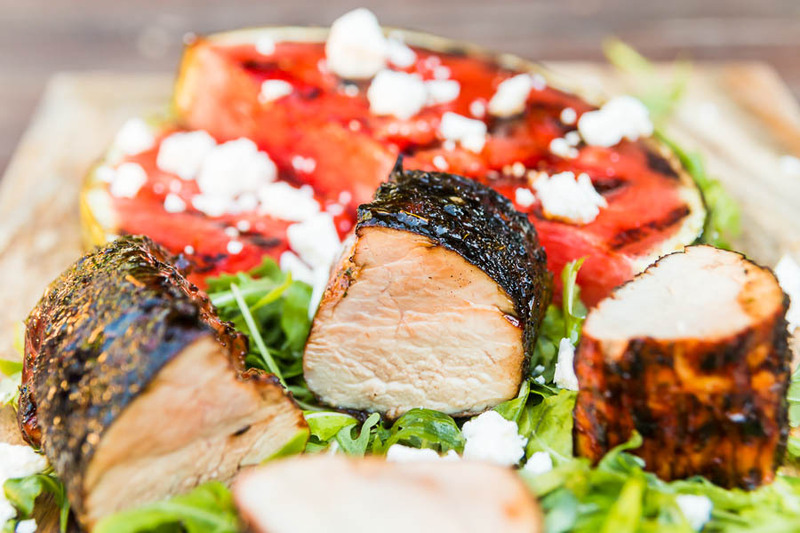 Grilled watermelon is the perfect side for this spicy glazed BBQ pork tenderloin, add a little salty feta cheese and peppery rocket and up your BBQ game! 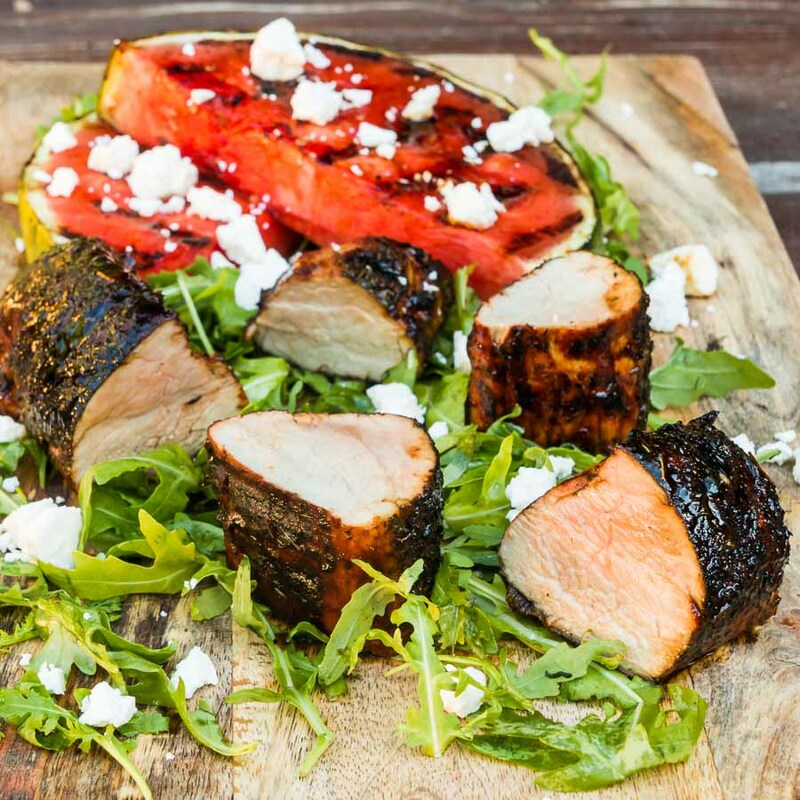 Glazed Pork Tenderloin With Grilled Watermelon. Flavours meant to bounce off each other and contrast each other define all of my recipes. 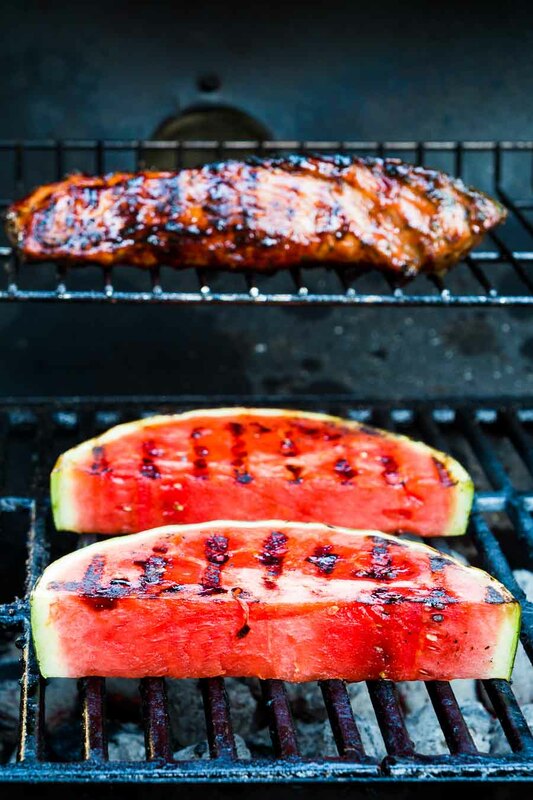 So here we have the bitter, sweet and salty brown sugar pork tenderloin offset by the sour sweetness of grilled watermelon. These flavours are all pimped up with the sharp saltiness of feta cheese and the fresh peppery rocket, or arugula as parts of the world call it. A watermelon salad is a pretty classic recipe idea as is the watermelon and feta combination. Grilled watermelon seems somewhat less common, I have no idea why it is wonderful. It is an idea I use in my grilled shrimp with watermelon recipe. Unlike that recipe, this is simple and clean watermelon simply grilled. It is there to provide a clean and refreshing contrast to the spicy pork tenderloin. What does Grilled Watermelon Taste Like? That may sound like a silly question, and the short answer is equally silly… It tastes like watermelon. Like all things, the full answer is a little more nuanced. One of the things that happen when grilling watermelon is that water evaporates. This intensifies the flavour of the watermelon and makes it even more watermelony… Is that even a word? Of course it is, I just made it up! In fact the longer you cook watermelon the more intense the flavour becomes. The second flavour profile you will pick up on is a bittersweet flavour. The flesh in contact with the grill grates begin to caramalise giving that classic flavour we expect from BBQ recipes. Finally, there is a distinct change to the texture. Regular readers will know that texture is just as important to my cooking as flavour. 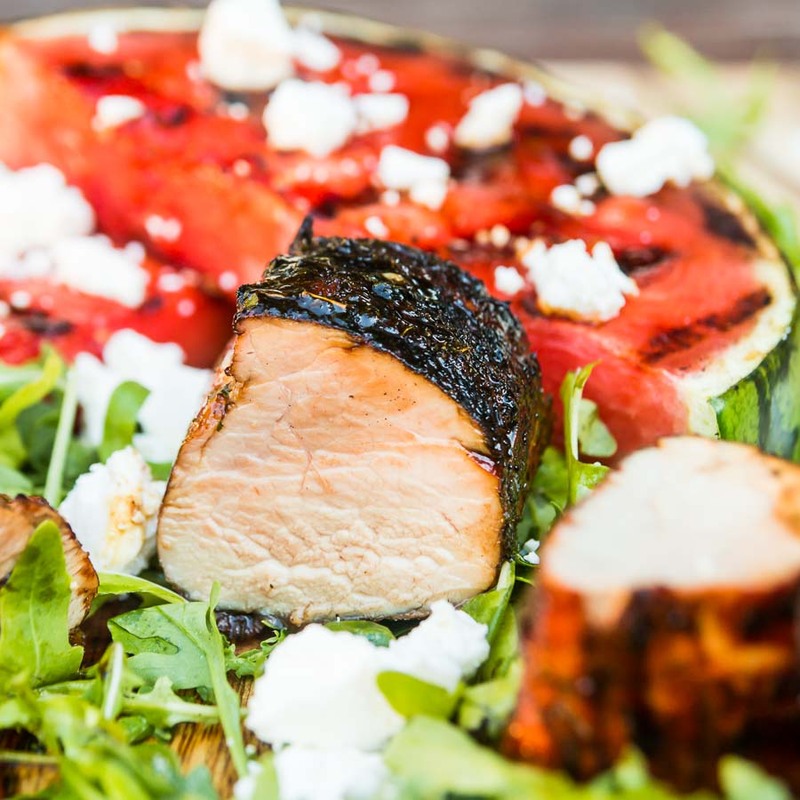 Grilled watermelon softens as it cooks and the texture becomes very different. It is almost similar to a great quality piece of seared tuna in terms of texture. Still firm but smoother and softer, but do not worry, it does not taste like fish… Because that would just be bizarre and weird! Considering my love of slow-cooked food I always seem to cook quickly on the BBQ. I guess my beer consumption during the downtime would mean me ruining lots of food if I slow cooked on the BBQ. That means grilling pork tenderloin is perfect for the garden cook like me. It is tasty, quick and simple to cook. It is also perfectly scalable you can buy lots of it and the cooking time remains the same. Apparently, there are lots of folk that have an aversion to fattier cuts of meat too. I have no idea why, it is one of lifes oddities. But pork tenderloin is lean which means your pickier guests will have no complaints! 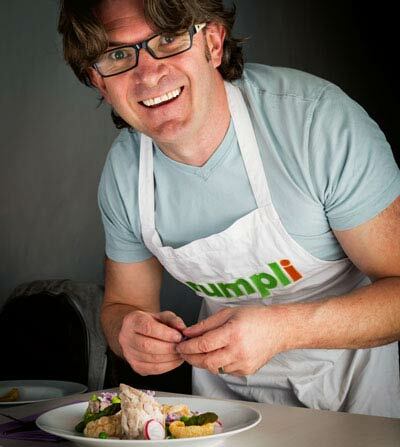 I have written at length about pork tenderloin here on krumpli. Whether it be in fancy recipes like this fancy roast pork tenderloin with apricots or this comforting pork tenderloin with Camembert it is a great choice of meat for quick cooking. The secret to cooking pork tenderloin is in the resting, hell who am I kidding it is the secret too cooking all meat! Just because you are cooking on the grill or BBQ does not mean you should skip this step. Simply place the meat on a chopping board and tent with foil and let it sit for a while. For this recipe, the perfect resting time just so happens to be the amount of time it takes to cook the grilled watermelon. You are welcome! Now go away and cook! Mix together the thyme, parsley, pepper, and salt and then place in a bowl. Roll the pork tenderloin in this mix and set aside. Cut your watermelon slices, you want something around 2.5cm thick. Place the brown sugar and hot sauce in a pan and place on the grill whilst it is settling and bring this down to a syrup to form a sweet spicy glazed crust on your pork. When the grill is ready and settled pour the sugar glaze over the pork, be careful it will be insanely hot. Remember this is sugar it will colour really quickly you are looking for around 45 seconds to a minute each side. When the pork is nicely coloured move to the indirect heat, close the lid of the grill and cook for 10-12 minutes, maybe 15 if you like really well-done pork. Remove from the grill and allow to rest for 5 minutes under a foil 'tent'. Grill your watermelon over the direct heat for 2-3 minutes each side. Serve with rocket and crumbled feta cheese. I love the combination of pork and watermelon. It’s something that is new to me. Grilled watermelon is amazing! I love the idea of grilled watermelon! Especially with the feta cheese. You’re right, I don’t see it very often grilled and I don’t know why. Can’t wait to try it! Thanks Danielle, it really is a great way of playing with watermelon. I’ve been having a lot of BBQs lately and I think this deliciousness would be perfect to try at the next one. 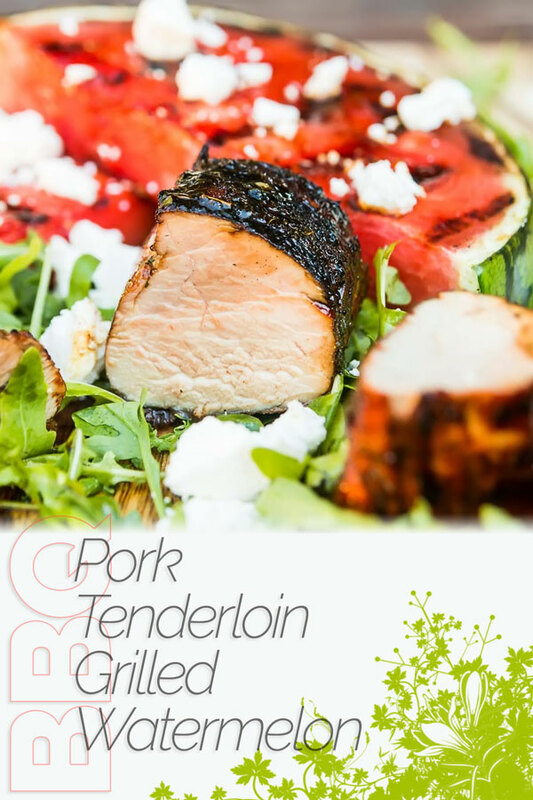 I love glazed pork tenderloin and that grilled watermelon looks divine! I am obsessed with grilled watermelon at the moment, so I am always looking for new ways to enjoy them. This looks lovely and summery.